Standard Vortex Enclosure Coolers are available NEMA 12, NEMA 4 and NEMA 4X versions, and can be purchased with an electric thermostat or without a thermostat (constant run). The electrical enclosure cooling thermostat model maintains tight control on the temperature setpoint of +/- 3 deg F. +/- 1.6 deg C. Vortex electric enclosure cooling systems are available in cooling capacities ranging from 400 BTU/hr to 5000 BTU/hr. 117 to 1465 Watts. Steel mills are extremely hot and often dirty environments yet their operations rely on highly sensitive electronic equipment which must be kept clean and cool. How to solve this inherent contradiction? Many steel industry firms turn to Vortec for expert understanding of their unique cooling needs for targeted cooling. Control panels in food manufacturing plants must be protected from frequent wash-downs as well as high temperatures, or it can result in thousands of dollars of lost revenue. 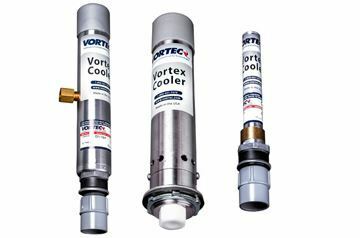 Vortec's coolers are compact and lightweight enough to do the job. A pipe coating firm adapts Vortex A/C enclosure coolers to solve a host of space, heat, and operational issues. Featured in organic finishing section of Metal Finishing magazine, this case study explains how natural gas pipeline powder coater EP Pipe Coating (Panama City, Fla.) used four Vortex A/C enclosure coolers to solve space and configuration issues posed by conventional air conditioners on an OEM powder coating system.